This evening I went on an urban hike in the Berkeley hills with a fun group of people. The hike was a zig zag up several pedestrian stairways until we got up to Grizzly Peak. It was sort of like real-life Donkey Kong! It was quite a workout, too. I have new-found respect for Jumpman’s conditioning. 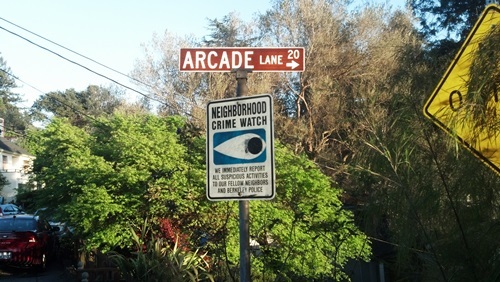 Anyway, when we got to the top, I saw there’s actually a street there called ‘Arcade’. How cool is that? ← Pin a Go Go is Coming!